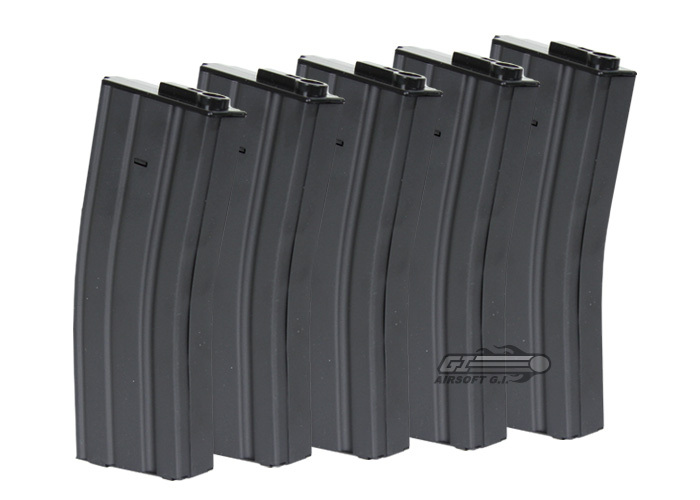 These magazines are recommended for use with the A&K, Echo 1, JG, Tokyo Marui, Classic Army, VFC, ICS, G&G, and G&P M4/M16 series AEGs, it may work with other brands AEG but cannot be guaranteed by Airsoft GI. First review! Anyway these midcaps are a great upgrade from the high caps I used before. You may ask why i said upgrade from high caps but there are a few reasons. First, less ammo per mag adds realism. Second, you can shoot all 120 rds because there's only one spring. There is no gear to crank on the bottom. Third, they are easy to load with any normal speed loader. Fourth, there is no rattle of bbs when moving to give away your position. All round these are great mags. The only con could be the weight. Because these mags are full metal, when they are loaded and all packed on your rig, it adds some weight. It is easy to configure your rig so that not all the mags are puuling the weight to the very front. I currently was using the kwa 120 but I was having issues with it fitting my A&K Masada. The magazine would fall out so I hade to put tape to keep in. I also had feeding issue in full auto it would skip bbs. The king arms mags work great on my Masada it fits perfectly and no feeding issue. The weight. I have 8 in my plate carrier and it add a lot of weight, but if u look and in a positive way it makes it more realistic.and keeps u in shape.